The beginning of the school year on Cowper Campus has been a bustle of activities. As is the tradition at ISTP, the month of October brings with it the themes of harvest and celebration. These themes work well with the French educational approach to taste week, a week devoted to the discovery of the palate and the senses. On Cowper, taste week is clearly visible in the classroom through tasting activities, food science, and class collaborations. Each grade level engages in age-appropriate activities that begin to introduce the idea of taste and the possibilities that it opens. It is a wonderful opportunity for the children to gain a new perspective on food and eating. In the early years we put an emphasis on discovery and opening new horizons. We encourage students to savor food using all their senses. The Chinese Kindergarten classes began their adventures by visiting stations in each of the Chinese classrooms. The students were presented with a variety of items to try: lemon, wasabi, ginger, tea, crackers, and chocolate sauce. They were asked to try each item and describe how it tasted using new vocabulary such as salty, sweet, bitter and sour. As the students tasted new items, they gained a better understanding of what the descriptive words meant as well as what smells might be associated with bitter, spicy or sour. The experiments continued with a sampling of different varieties of fruit. The students tasted the fruits and decided whether or not they enjoyed the flavor. After tasting the fruit, they began to create their own fruit juice recipes. Students wrote down the ingredients to their fruit juice concoctions in a recipe format so they could recreate the juice later. Each student presented his or her new juice to their classmates, who voted on how much they liked the drink. 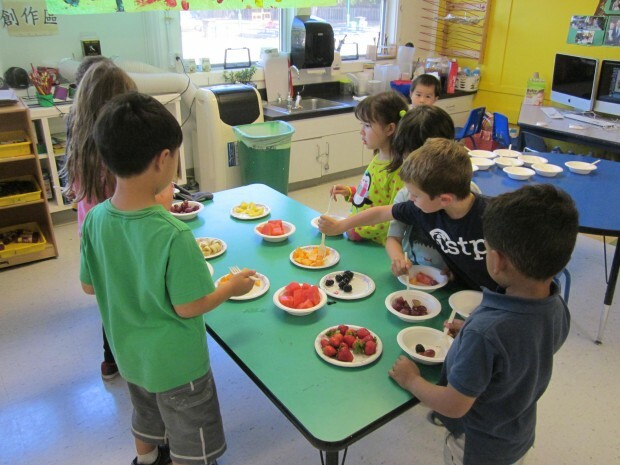 The French Pre-Kindergarten classes had a similar approach to taste week. The goals for the week included exposing students to new vegetables, studying differences in varieties of fruit, and learning about the creation of a dish. 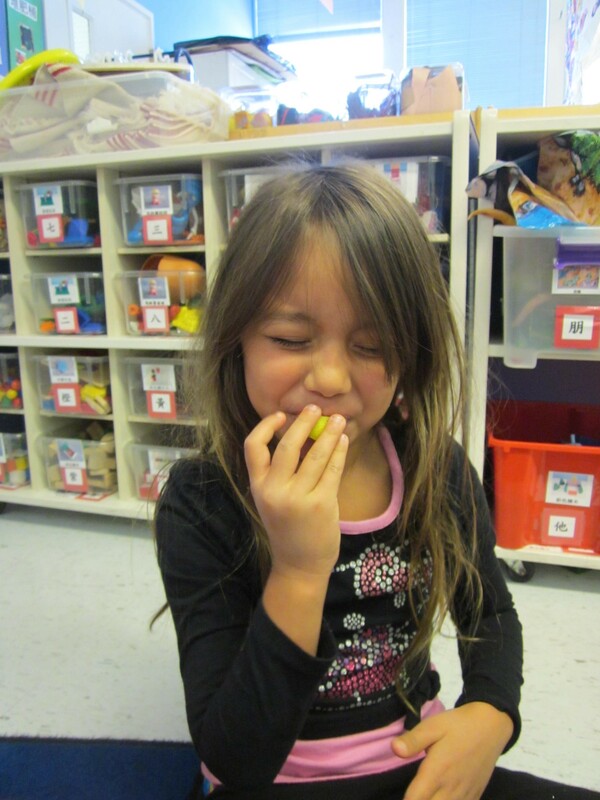 In Cécile's class they began with a vegetable tasting session. The students were given note cards to make notes about the flavors of each vegetable: salad, tomatoes, radishes, and carrots. They made notes with a red dot if they didn't like the selection and a green dot if they did. It was wonderful to see how the children's tastes differed. They spent time comparing their tastes and getting a better understanding of the individuality of taste. Next came a fruit collaboration between Mélanie and Cécile's classes. They used apples to introduce differences in taste within a single fruit. The children were given three different varieties and colors of apples to taste: a crisp yellow, a juicy red, and a sour green. 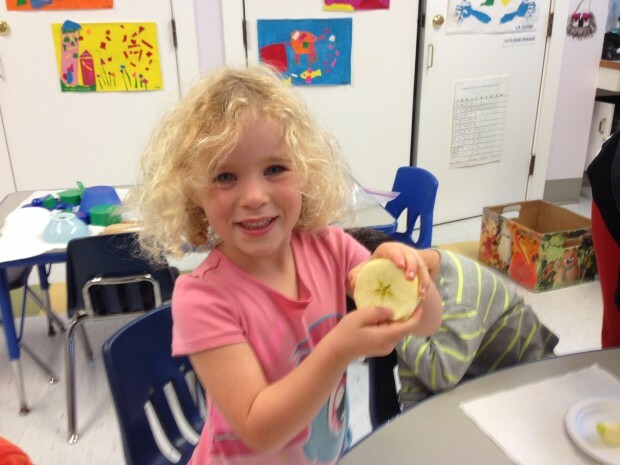 Prior to tasting the apples, the children examined the different aspects of an apple. They took out the core and bisected it, discovering the shape of the flower that had created the apple within the bisected piece. As the slices of apple were served, the children were encouraged to take time to experience the apples through touch and smell. Some of the apples had smoother skins, while other were rough. 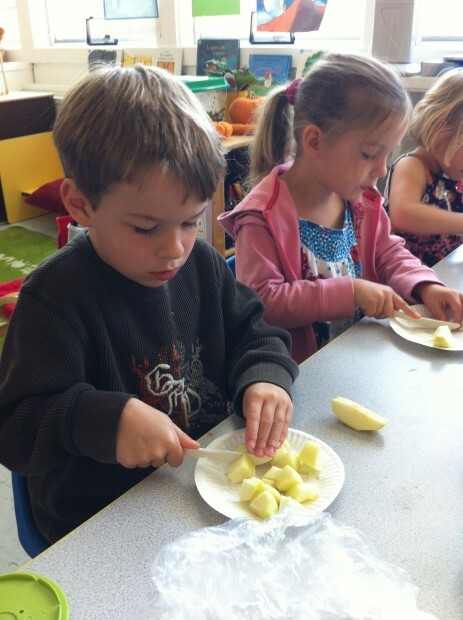 The students noted which apples they preferred and chose those apples to use in their cooking projects. Their fine motor skills were put to the test while chopping their apples to create applesauce and apple muffins. After students read the recipes, followed the instructions, and cooked the food, both classes shared in an apple feast! The Chinese Pre-Kindergarten classes and the English Kindergarten classes were also involved in activities. 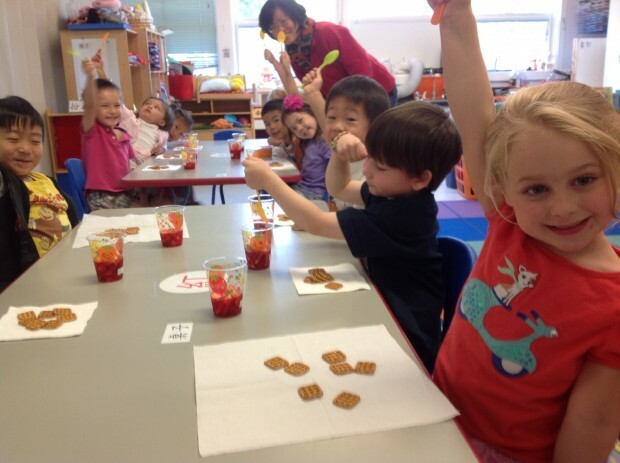 In the Chinese classes, the children made their own fruit jello cups. They were able to work on their counting and measuring skills while making their jello. They also created wonderful works of art with fruits and vegetables. The English classes did samplings of different wheat-based products such as whole wheat bread, bagels and pita bread. After the students had completed their tastings, they honed their writing and arithmetic skills. Each students wrote a sentence describing what their favorite wheat based-product was, and created an English K graph of the winning wheat product. Overall, the week was a success full of delicious smells and flavors. We look forward to seeing what next year's taste week will bring.